Day 12 of the 2017 NBA playoffs was an East Coast affair, as the Washington Wizards and Boston Celtics seized 3-2 series leads at home. Here are our three biggest takeaways from a slightly odd night in the NBA playoffs, which started early and ended with the Celtics suffocating the life out of the Chicago Bulls. There is absolutely no reason a weekday NBA playoff game should begin at 6 p.m. 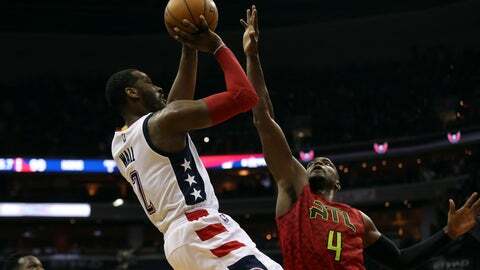 ET, as Game 5 between the Hawks and Wizards did on Wednesday night. We understand why this specific scheduling conflict happened. The NBA lined up a bunch of Western Conference games yesterday, then doubled down with two Eastern Conference games on Wednesday. In order for Bulls-Celtics to start at a reasonable local time, Hawks-Wizards had to tip early. But that's like driving your car into a river because you decided you didn't like the route you chose to the grocery store. The NBA could have — and should have — broken things up so that each night features at least one game in the East and one in the West. 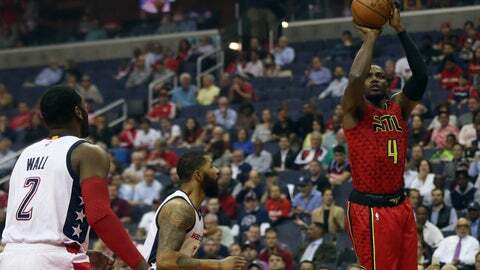 Instead, they let the cards fall where they may, costing Washington its hard-earned home-court advantage in Game 5, as the lower bowl didn't fill up with Wizards fans until the second quarter. Come on, Adam Silver. It's 2017. If we can't figure out how to use computers to draw up rational schedules, what are we even doing here? You know what nominal Bulls coach Fred Hoiberg was doing in a pivotal Game 5 on the road? Nominal Bulls coach Fred Hoiberg was messing with new rotations that didn't play together at all in the regular season — that's what he was doing in a pivotal Game 5 on the road. 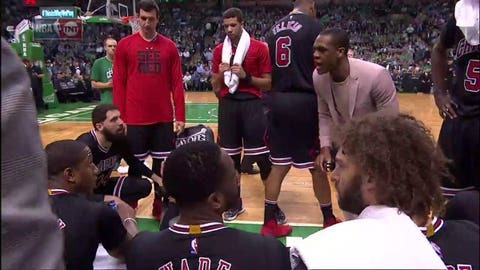 Rondo, meanwhile, was spotted coaching up the Bulls during key moments on Wednesday, and the Chicago players gave him their attention. Even Jimmy Butler and Dwyane Wade seemed locked in. If Rondo can't make an impact on the court (and he'll try to play in Game 6 with his fractured thumb, make no mistake about that), he'll do anything he can to help the Bulls extend their playoff run. Maybe Chicago would even have the 3-2 lead had Rondo been coach from the start of Game 5. We're used to players going flying on drives to the basket, when bodies collide and fouls are genuinely committed. Those flops are almost acceptable. But we've reached a saturation point with shooters pump-faking defenders into the air, then jumping into them to draw an easy foul and a trip to the line. Technically, it is a foul, because a defender gives up their right to the space in front of them when they leap into the air. It's also not basketball, and it turns off the casual fan who's tuning in for the playoffs. Dwyane Wade is far and away the biggest offender, as we saw throughout Game 5, especially late in the fourth quarter. The solution doesn't lie with the refs, though. Defenders need to smarten up and stop jumping on pump fakes. That will take away one of the biggest weapons in the arsenal of players like Wade who have to resort to shenanigans at this point to get the job done.